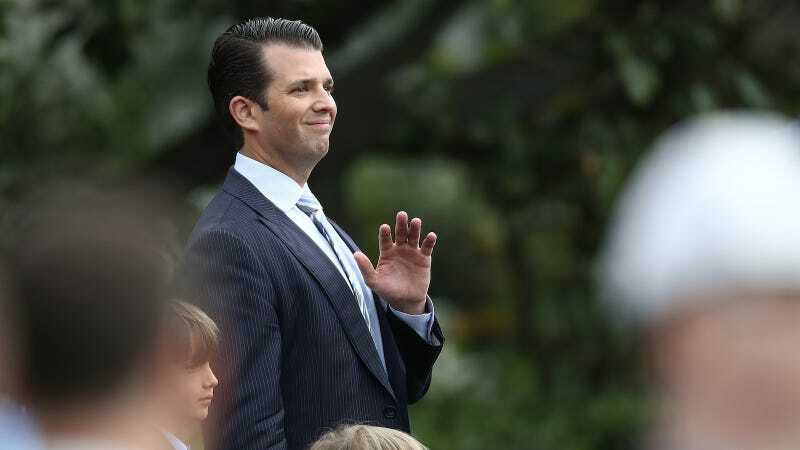 On Saturday, Donald Trump Jr. sat down with infamous shill Jeanine Pirro for an interview on Fox News. He was probably there to reiterate his dad’s confusing talking points, which is probably why he seemed confused. Consistent with that statement, the President never, in form or substance, directed or suggested that Mr. Comey stop investigating anyone, including suggesting that that Mr. Comey” let Flynn go.” As he publicly stated the next day, he did say to Mr. Comey, “General Flynn is a good guy, he has been through a lot” and also “asked how is General Flynn is doing.” Admiral Rogers testified that the President never “directed [him] to do anything . . . illegal, immoral, unethical or inappropriate” and never “pressured [him] to do so.” Director Coates said the same thing. The President likewise never pressured Mr. Comey. Comey has stood by his account of what happened, adding that it was more than a casual request. “When it comes from the president, I took it as a direction,” Comey said. Okay! Trump Jr. also said Comey’s testimony “vindicated” his dad, whch was much more on message. “I think he’s proven himself to be a liar in all of this. I think he’s proven himself to be a dishonest man of bad character,” he added, meaning Comey if you weren’t sure. The Post reports that Pirro enthusiastically agreed, and that she also attended a baby shower for Lara Trump, Eric Trump’s wife, that very same day.